Continuo is a tile laying game. Players take turns adding tiles onto the edges of previously laid tiles, scoring points for creating paths of colours. Points are given for the length of each path created. 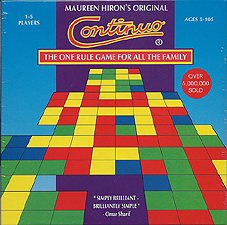 Play continues until all tiles have been used. The highest score wins.